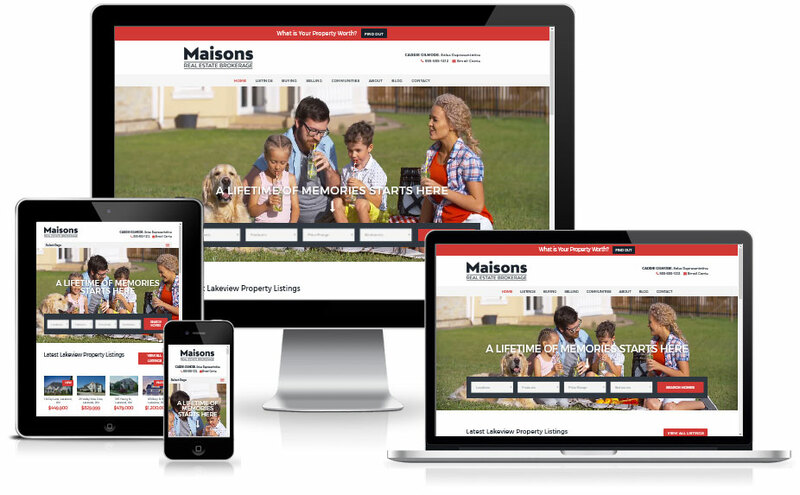 Maisons is a premium Divi child theme designed for real estate agents. Integration with the IMPress listings plugin makes it easy to manage real estate listings in your WordPress dashboard. Offering a free home appraisal is a popular method for real estate agents to get leads from people looking to sell their homes. A contrasting “Find out” button means your free appraisal offer won’t be missed. Video is a very effective way to capture people’s attention on a web page. 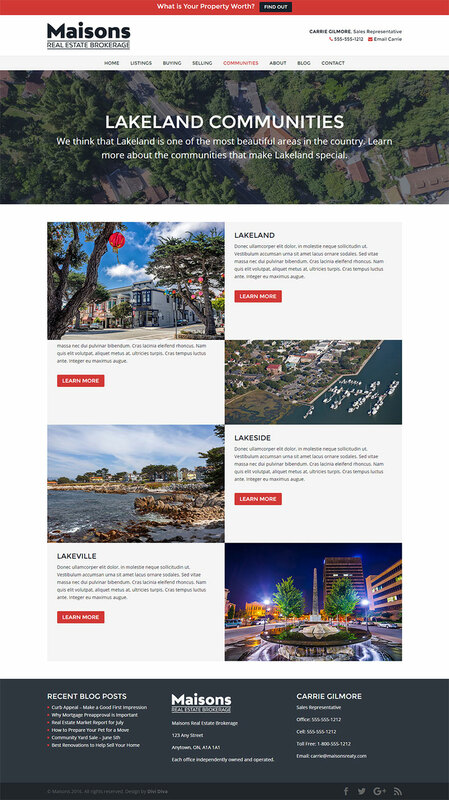 Choose a lifestyle video as we have in the demo site, or show a video overview of the area that you represent. If you don’t want to use a video, you can just replace it with a background image (you should upload a background image anyways, as video is not shown on mobile devices). Change the heading as required to suit the video or image that you have used. Buyers will often have a particular neighbourhood in mind when house hunting. Space is provided to link to the listings of 4 communites – if you have more than 4 you can change them up periodically, or choose the ones that you have the most active listings in to feature. An appealing image representative of that community leads in to the listings with a unique hover effect. An email newsletter is a good way to market to potential buyers and sellers. 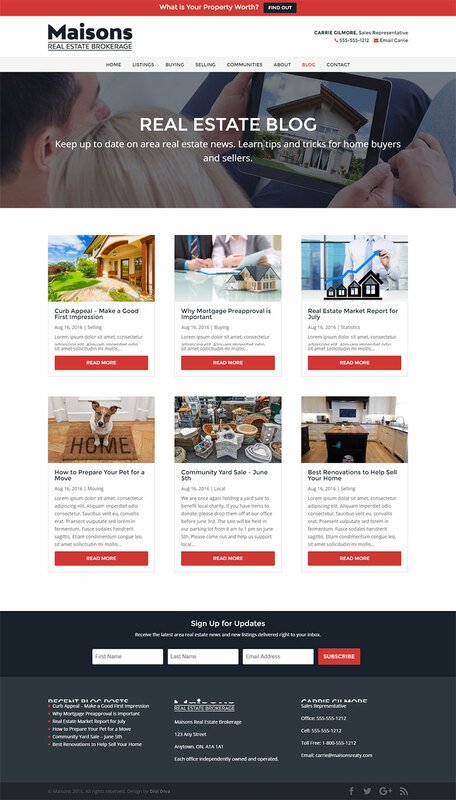 You can send out area real estate news of interest, as well as notification of new listings. The integrated Divi Email Optin module allows you to connect with Aweber or Mailchimp email services. A widget area has been added to the header, so you can add your name and contact information in addition to your brokerage logo. Includes click to call (on mobile devices) and click to email function, ensuring you just a click away. The 4 most recent listings will automatically be featured on the home page, ensuring they get extra exposure and you always have fresh content on your home page. A link to “View All Listings” will take people right to your main listings page if they want to see more. The 3 most recent blog posts will automatically be shown on your home page, once again ensuring that your home page always shows fresh content to viewers. Of course, be sure that you are adding new blog posts frequently! Showing fresh content also helps you with search engine rankings. A link at the top will take viewers to your main blog page if they want to read more blog posts. The standard footer will appear on all pages. 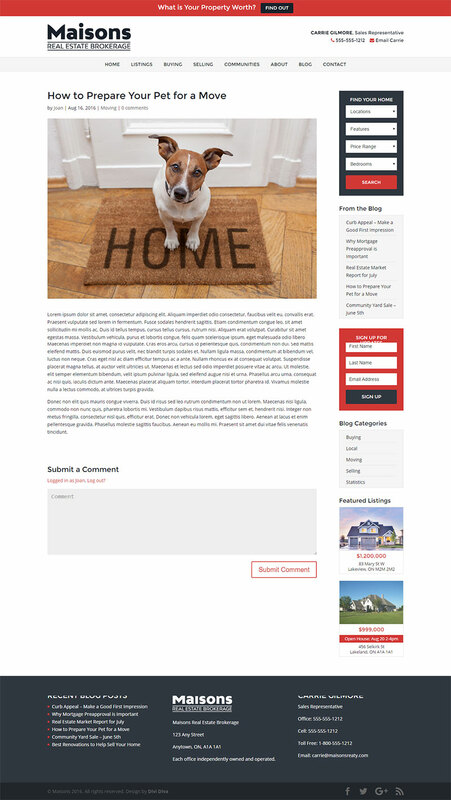 We have it set up to display the latest blog posts as well as your contact information and your brokerage logo and address. You can change this if you prefer, and you can also include Divi modules in the footer widget area. We know that if you have a lot of listings to manage, having to add your image in a separate gallery plugin and copy a gallery shortcode back to each listing can be time consuming. With Maisons you don’t have to do that! All you have to do is upload your images right in the listing, and a responsive, touch-enabled slide show will be automatically created. The Font Awesome Icon Set is integrated and ready for you to use. 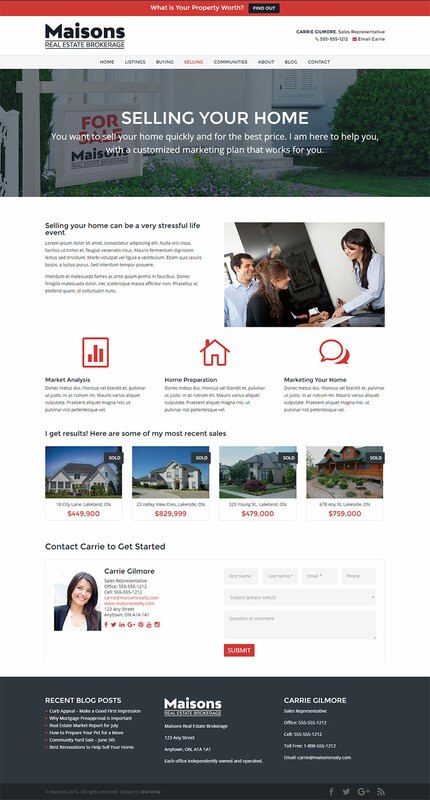 The property overview is set up with Font Awesome icons to highlight key facts about the house. Visit http://fontawesome.io/ to learn more about using Font Awesome icons. 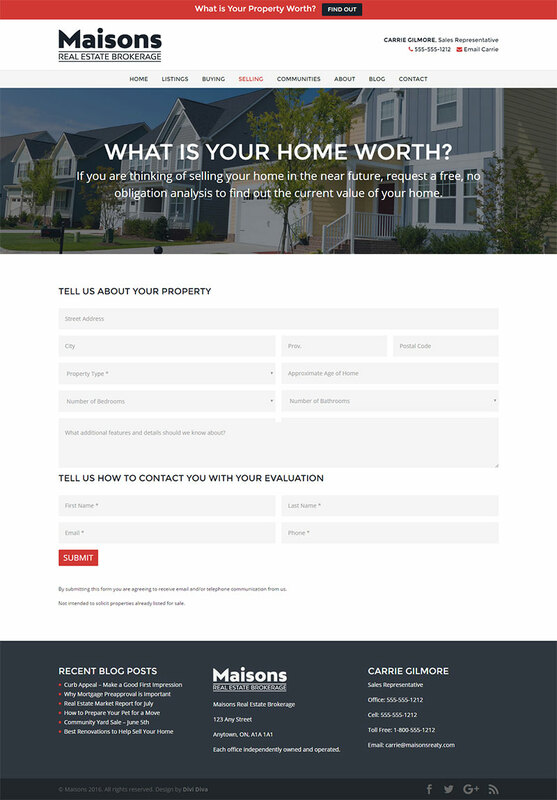 The custom Listings post type includes fields for the key information about the property (price, address, lot size, number of beds and baths, square footage, etc.) This makes it easy for you to enter all the information, and it will be displayed in a standard format on each listing. You have the option of using the mapping feature built in to the IMPress listings plugin to generate a map by entering the location latitude and longitude. Or you can install a separate map plugin if you prefer. You can also include a video tour of the property by entering the video shortcode. The integrated contact form includes all of your contact information, as well as a contact form, making it easy once the person has viewed the listing to contact you for more information or to book a personal tour. The listing inquiry form submission will include the property they were viewing so that you can respond appropriately. Providing area information can be helpful to potential buyers who may not already live in the area. 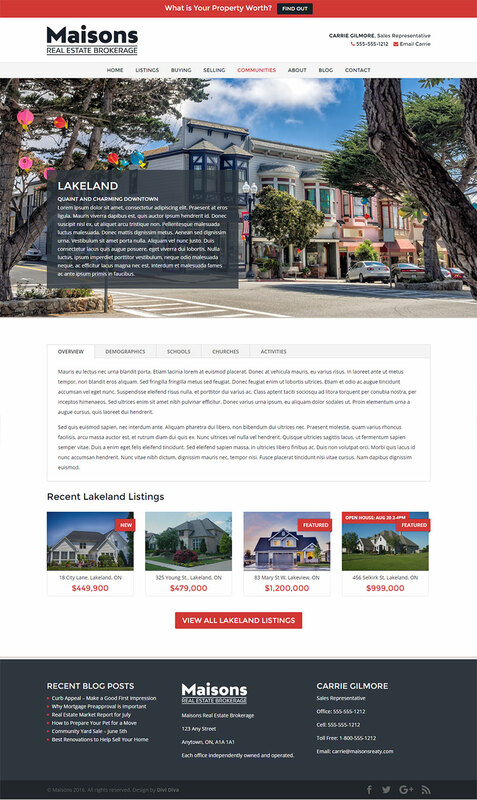 A community overview page allows you to include a brief introduction to each community in your market area, with a link to a page with more detailed information. A community detail page for each community features a hero image representing that community, again with an overview. A tabbed section lets you include more detailed information like schools, shopping, churches, transit, etc. Finally, the 4 most recent listings for that area are shown – leading viewers to look at those individual listings, or to follow the link to view all listings in that area. Offering a free home evaluation is a popular method used by many real estate agents in order to get leads on people who may be interested in selling their home in the near future. You can also edit the form if you need to obtain different information in order to provide an effective home evaluation. 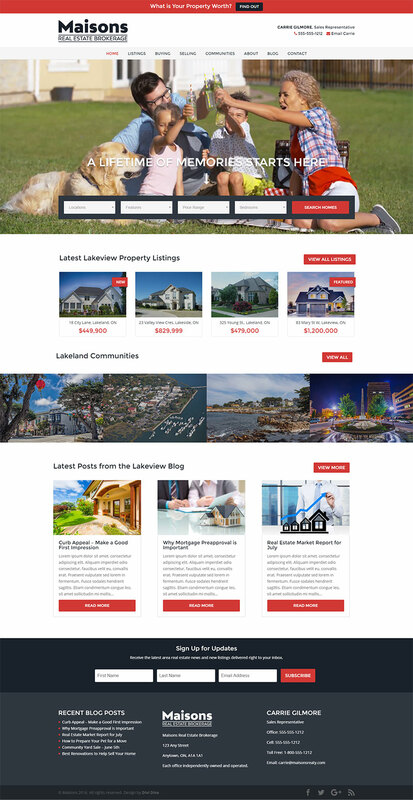 Having a blog can allow you to provide useful information on real estate and local area activities to visitors. This helps you to provide fresh content to your site, which is a factor used by search engines when determining the ranking of a particular site. Providing additional content can also help bring traffic to your site through search engine searches. The blog page will show excerpts from your most recent blog posts. 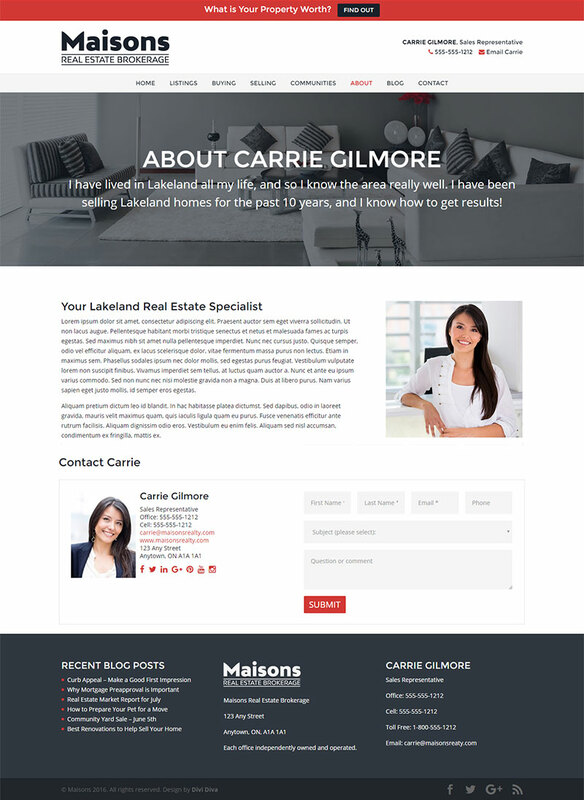 The individual blog posts include a sidebar with a listings search widget, email optin form, a featured listings widget, as well as links to recent posts and blog categories. You can include information here about how the buyer can benefit from working with you. 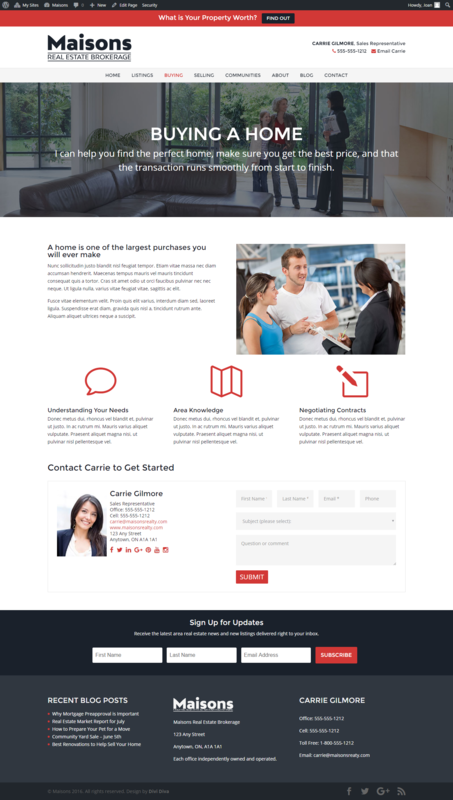 A handy contact form makes it easy for potential buyers to take the next step and contact you. A email optin form makes it easy for them to sign up for updates when new properties come on the market. Provide information on the benefits sellers can attain by selling their home with you. A selection of recently sold listings can give buyers confidence that you get results. A contact form makes it easy for them to take the next step and contact you to list their home with you. People deal with people, and a real estate transaction is a major life event. It is important to share a little bit about yourself so that people can get to know you and feel comfortable with you. Again, a handy contact form is there ready so that they can get in touch with you. 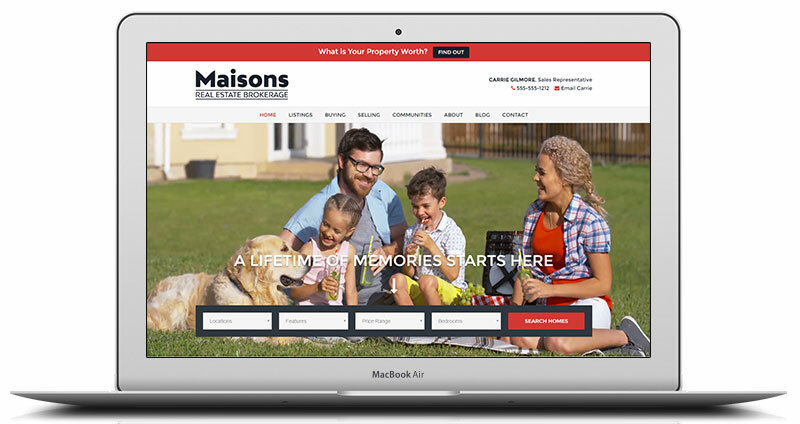 In order to use the Maisons child theme, you will need the Divi parent theme for WordPress, which is not included with this product. You can purchase an annual subscription from Elegant Themes, which includes the Divi theme. You will also need a hosted WordPress website. Maisons is compatible with Divi 2.7+. It is highly recommended that the theme be installed on a new install of WordPress. Please be aware that you will need an amount of experience with WordPress and the Divi Theme to take full advantage of our child themes. If you intend to make customizations beyond changing content, a reasonable knowledge of CSS is also required. Changing real estate terms used by the IMPress listings plugin requires modification of php code. Please make your decision to purchase based upon your skill level, and be sure that our products meet your needs. Once purchased, you are free to use this Child Theme for both personal and commercial use on as many sites as you like for as long as you like. You cannot resell or redistribute the theme or any of its parts to anyone else. Support is provided for 6 months from the date of purchase. Please note that the images and video in the demo are not included in the child theme package. The child theme includes placeholder images with the correct sizing.